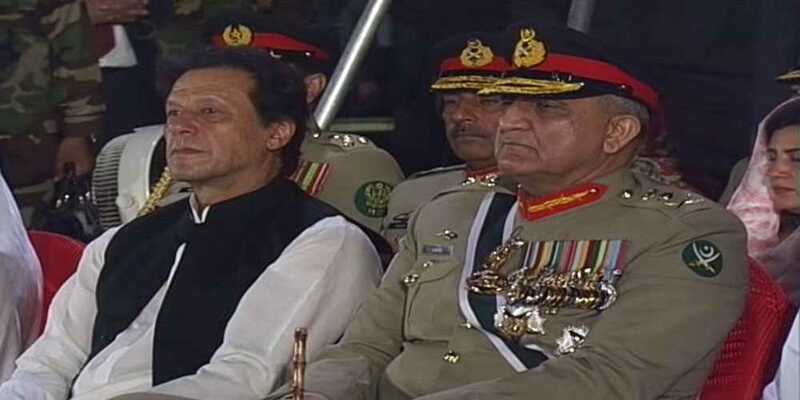 Prime Minister Imran Khan and First Lady Bushra Imran on Thursday arrived at the General Headquarters to attend a ceremony to commerate Pakistan’s 53rd Defence Day. The day dawned with gun salutes, 31 in federal and 21 in the provincial capitals. Special prayers in all mosques, especially of those in defence formations held asking for well being and prosperity of the country. Fateha and Quran Khawani also held for those who laid their lives in the line to serve the nation, opting to embrace supreme sacrifice. Wreath laying ceremonies took place at the mausoleums of the recipients of Nishane Haider (highest gallantry award) which was attended by the senior officers of the respective areas across the country. Personnel of three armed forces organised a ceremony at Fortress Stadium in Lahore. The event kicked off with a march past by Pakistan Army and Rangers. Pakistan Air Force did a fly past with its JF Thunder F-17 and fighter planes. Thousands of participants cheered during the display. Punjab Governor Chaudhry Sarwar and Chief Minister Usman Buzdar were the chief guests. Pakistan Navy organised a special ceremony at Naval Headquarters in Islamabad on Thursday morning. Vice Chief of the Naval Staff, Admiral Kaleem Shaukat was the chief guest while floral wreath also leaid at the martyrs’ monument. On the occasion, the message of the Naval Chief was also read out in which he highlighted the role played by Pakistan Navy in the war of 1965. A change of guard ceremony was held at the mausoleum of Quaid-e-Azam Muhammad Ali Jinnah in Karachi on the occasion of 53rd anniversary of the 1965 war. A contingent of the Pakistan Navy, clad in ceremonial dresses, presented the guard of honour and assumed the ceremonial guard duties at the mausoleum. On the other hand, a smartly turned out contingent of Pakistan Army presented guard of honour at Allama Iqbal’s mausoleum in Lahore. Garrison commander Major Genral Muhammad Aamir laid wreath at the grave penned down his thoughts in the guest book. Imran earlier in the day said Defence Day was the best reflection of national unity and solidarity. “This year the Defence Day is quite unique because the Armed Forces of Pakistan, keeping in view their magnificent traditions, have achieved standout achievements in the war against terrorism which provided further stability and continuity to the motherland,” he added. The prime minister asked the world powers to play their role to stop Indian cruelty and aggression in the occupied Kashmir. The resolution of Kashmir issue according to the United Nations resolutions was indispensable, he said.